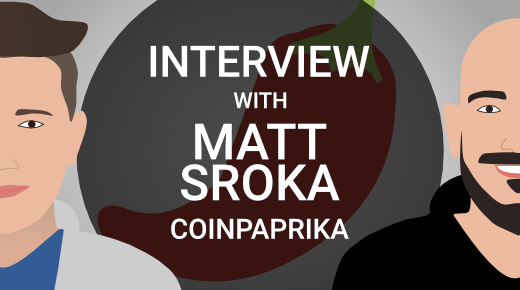 I am pleased to have Matt Sroka with me, who is the head of marketing at coinpaprika. Hello Matt! First of all, can you tell us a bit more about coinpaprika – what are you guys working on, what are your future goals and what sets you apart from other sites like CoinMarketCap or CoinGecko? Thank you, Chris, for inviting me to this interview! To be honest, during the past year, because that’s the lifespan of coinpaprika – we haven’t been interviewed for a broader audience yet, so you’re the first one who can know us better! But to the point, short introduction of who we are – we’re based in Poznan, Poland. Our team has +10y experience in cybersecurity and overall IT businesses. Coinpaprika’s story begins in January 2018 when the hype on crypto was outrageous. We’ve spotted that the crypto world is still lacking a data provider that could be 100% reliable with a better UX and without misleading ads – we simply thought that what was the number 1 back then, could be done better. So we decided to create an experimental project called “coinpaprika.com”. The official launch of the website is dated back on April 2018. Back then, we couldn’t even imagine that after just one year, we could be a number 1 website for over hundreds of thousands of users around the world. As coinpaprika, we believe that equal, ad-free information access is essential if we want the industry to grow. We already deliver a professional API for everyone – and what’s best, we don’t charge 700$ per month for that! For those who think that it’s just a catch, go and check for yourself! Our future goals? We have 2 main goals for 2019. At first, we want to improve the quality of the data we deliver even more. We want to dig deeper into the blockchains and fight with fraudulent actions from exchanges. It’s no surprise that many institutional clients are opposing to enter the cryptocurrencies market in light of recent reports saying that only 10 out of 81 top exchanges are reporting correct data. That’s a little over 12% and it’s a big issue we need to work on. If we want to encourage new customers, we have to clean up the mess we have in our own yard. The second thing we want to achieve is the official launch of our new app – COINS. It is going to be an app that connects 3 aspects into one ecosystem – coinpaprika database, multi-asset wallets and exchange features. To speed up the whole process, we are looking for equity investors, if you want, you can learn more at coins.coinpaprika.com. With the introduction of exchange rankings by their trading volume came the difficulty of fake reported volume or so-called wash trading. As the ranking of exchanges is an integral part of coinpaprika, what is your take on the significance of volume and how trading volume across crypto exchanges has developed in the past months/years. Volume is one of the major and one of the most important factors in cryptocurrency trading, and that’s a fact. Thanks to trading volume we can know if a given asset has a bigger or smaller interest for traders. Nonetheless, wash-trading is making this one much less accurate and it drives the need to introduce new metrics, which can’t be easily faked. The reported volume during the past months has been on the rise, but due to the wash-trading, it became very hard to estimate real trading activity. As I explained a little bit in the previous question, detection of fraudulent activities made by some exchanges is one of our highest priority tasks for the upcoming year. Coinpaprika recently integrated a metric called “Depth of Market”, which is a different ranking method than by trading volume – what is it about and what led to its development? The “Depth of Market” is part of our transparency tab. It’s our attempt to counter the unfair actions some exchanges commit. It aggregates the sell and buy orders to provide a better image of what is happening in the markets. Sometimes you can see a large volume being traded on the exchange, but if you look at their order book, it’s as thin as a paper sheet. That’s the first sign, that wash-trading may be happening there and you should approach that exchange with caution. We have used 10% span instead of 1% because we wanted to measure more coins than just BTC and ETH – other altcoins have much lower liquidity. We wanted to make a standardized way to measure liquidity with this metric. Author’s note: Below you can see a screenshot of the “depth of market” metric under the “transparency” tab on coinpaprika. It is a measure of open buy and sell orders within 10% of the current spot price. Creating new metrics is always a walk on a thin line. On one side, they are very simple and were once significant (e.g. trading volume or code commits) but were then abused by certain projects to position themselves higher in rankings. On the other side, they can be very difficult to understand and have not yet been faked, but nobody understands them and therefore they are not used. How do you see the depth of the market metric in this? I would say the depth of the market is somewhere in between. Many advanced traders know very well that having great depth on the market is a must-have if you want to start trading there. Our metric is a way to go for an average user – we display advanced data in a user-friendly way, with buy orders on the green, and sell orders on the red. We also add a 24h volume made on that specific market to compare it with the combined orders. You got everything you need without having to dig deep into every exchange interface. Let’s go a little more into detail about the “Depth of Market” metric on coinpaprika itself. The ETH/BTC pair for example currently shows only 18 entries, despite the integration of more than 300 exchanges into coinpaprika – is the tool still under development and how time-consuming is it to integrate further exchanges into it? That’s true what you’re saying – the ‘Depth of Market’ tool is still under development. We are currently integrating more exchanges to it, and we will aim to integrate as many as we can – unfortunately there are still a lot of exchanges, which don’t share necessary API endpoints for the integration. We are able to read the overall reported volume via API, but not their order books. Integrating new exchanges into ‘Market depth’ is much more time-consuming than introducing it on coinpaprika – it needs much more code and time to check, if everything is reported correctly. Just keep in mind that right now, coinpaprika gathers data from over 23 000 markets, simultaneously – integrating with every one of these markets’ order books will take some time. Another technical question: Do you have plans to allow users to select multiple trading pairs in the “Depth of Market” metric to display aggregate data (for example aggregate the order book depth per exchange across different stable coins)? That’s something we’re discussing for a long time, it’s possible that we’ll do that, but first, we need to finish what we started – integrate as many exchanges as possible, then we have plans to further integrate the ‘Depth of Market’ metric into the coinpaprika main site – it will be one of the major metrics apart from Market cap and Volume. If the “Depth of Market” metric will be successful, I guess we will see so-called “spoofing” among some exchanges, where the order books appear liquid, but once the buy/sell button is clicked, these orders will disappear shortly and then will appear again. This is probably even worse than reporting fake volume. Could you imagine to extend the tool with a functionality, that counter-checks the prices of larger executed orders with the reported order book, to identify exchanges practicing spoofing? Yes, we are aware of the ‘spoofing’ issue too. We are currently researching, how we can prevent it, and one of the ideas is quite similar to yours. Even though we think that conducting ‘spoofing’ is much more sophisticated than wash-trading because it needs real money to be involved in – there must be orders put in – and thus orders are always at risk of executing. If the exchange would work as you said – it would be fraudulent from the start – and would need, even more, counter-measures – for example, similar to currently used for Volume – Adjusted Volume. 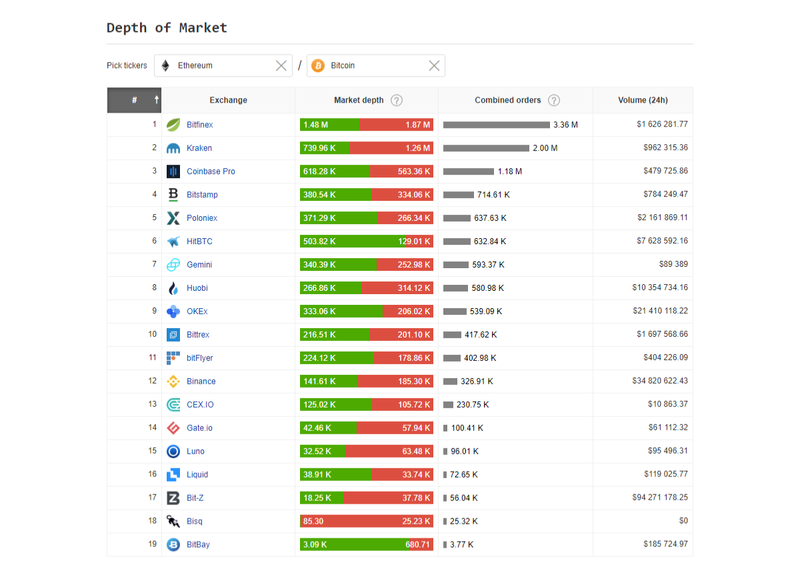 The “Depth of Market” metric is certainly an important addition to exchange rankings and I absolutely look forward to its further development. Thank you very much for the interview!